Photographer Ide Geert Koffeman assembled this view of Comet PanSTARRS (at far left) and the crescent moon (at far right), as seen from the Dutch province of Flevoland, on Tuesday evening. Five vertical HDR images were stitched together. Click on the image for a larger version, or check SpaceWeather.com for more. Many stargazers attempting to view the Comet PanSTARRS on recent nights have been thwarted by the comet's low position in the western sky. But on Tuesday night, the thin crescent moon will lend a hand. Over the past weekend countless observers across in North America and Europe tried — and for the most part failed — to see Comet PanSTARRS, in part due to its low altitude above the west-northwest horizon. The bright glare of the evening twilight sky just is also a hurdle, since it can as make the comet harder to see just after sunset. But fret not, comet lovers! Comet PanSTARRS' position above the horizon is noticeably higher on Tuesday evening, and the moon can be used as a benchmark to point your way. If you end up successfully catching a glimpse of them, the moon and the comet will not be any higher than 10 degrees above the horizon. That is about the size of your clenched held out at arm's length. If you have a house or some trees in your line of sight, then you're going to have to find some other viewing site. In order to boost your chances of seeing Comet PanSTARRS, be sure to arrive at your viewing site in time to see the sunset. Take note of where on the horizon the sun sets. Now wait about 30 minutes as the sky begins to darken. Truthfully, it will still be rather bright looking toward the west a half-hour after the sunset. This was one of the main problems people have had in recent days in trying to see the comet. However, first things first: Let's locate the moon. Take your clenched fist and measure off 10 degrees up from that point on the horizon where the sun disappeared about a half hour before. Now look a bit to the right from the top of your fist. That's where the crescent moon will be. Seeing the moon will be a bit of a challenge in itself because it will be very narrow, appearing only about 28 hours after passing its new phase. Because of this, the lunar disk will be only 1 percent illuminated. It will be oriented with its bright sliver down, resembling a cup or a thin smile on the sky. If you can't see the moon with your unaided eye, then use binoculars. Once you pick it up with binoculars, you should be able to find it without optical aid. Comet PanSTARRS stands out when seen from a high-altitude vantage point. "Here is the picture I captured ... from atop Mount Lemmon (at the Mount Lemmon SkyCenter). I run the stargazing programs up here and while hosting the show for the guests I captured this picture," Arizona astrophotographer Adam Block said in an email. Astrophotographer Adam Block captured this view of Comet PanSTARRS amid a line of power poles near Tucson, Ariz., on March 10. For more from Block, check out the Caelum Observatory. The location of Comet Pan-STARRS low in the western horizon in March 2013 is shown in this sky map released by StarDate Magazine, a publication of McDonald Observatory at the University of Texas. With the moon found in the evening sky, it is time to use it as a guide to spot Comet PanSTARRS. The comet will be located about 5 degrees to the left of the moon. Once again, you might not initially see it with your eyes, so use binoculars if you need to. Five degrees measures roughly "half a fist" in length. You'll know Comet PanSTARRS when you see it. It will appear as a bright, starlike "head" with a short, stubby tail extending from the head upwards and slightly to the left from the bright end. Like the moon, once you find it with binoculars, you should, with time, be able to make it out against the bright twilight sky. Comet PanSTARRS and the moon should be visible for about a half hour before they disappear into the murky haze always located near the horizon. Right now the brightness of Comet PanSTARRS, according to viewers who spotted it in the Southern Hemisphere, ranks at about first-magnitude on the astronomy brightness scale. That is about as bright as the brightest stars. Normally, a comet as bright as this would be categorized as a "Great Comet," but most observers feel that PanSTARRS does not fall into this category because it's not visible against a fully dark sky. The bright twilight background is working against making it a prominent eye-catching sight. And the comet's dust tail is not breathtakingly long, but rather short and rather stubby. To the naked eye, not much of the tail may be visible at all, though in big binoculars or small telescopes, some say that PanSTARRS is a rather impressive sight. Comet PanSTARRS is one of at least three comets in the night sky that are sending a thrill through stargazers. Another comet (Comet Lemmon) is currently visible to observers in Southern Hemisphere, while the third object is Comet ISON. Comet ISON is a promising celestial object that was discovered by amateur astronomers in 2012 and is expected to make its closest approach to the sun in late November. The comet will be only 800,000 miles (1.2 million kilometers) from the sun at its closest point, and could put on a dazzling night-sky spectacle. But it could also fizzle out. NASA astronomers and stargazers around the world are regularly tracking Comet ISON, as well as comets PanSTARRS and Lemmon as they shine in the night sky. If you snap an amazing photo of Comet PanSTARRS in the night sky, or any other celestial object, and you'd like to share for a possible story or image gallery, please send images and comments, including location information, to managing editor Tariq Malik at spacephotos@space.com. Joe Rao serves as an instructor and guest lecturer at New York's Hayden Planetarium. He writes about astronomy for The New York Times and other publications, and he is also an on-camera meteorologist for News 12 Westchester, New York. Follow us @Spacedotcom, Facebook or Google+. This article was first published on SPACE.com. 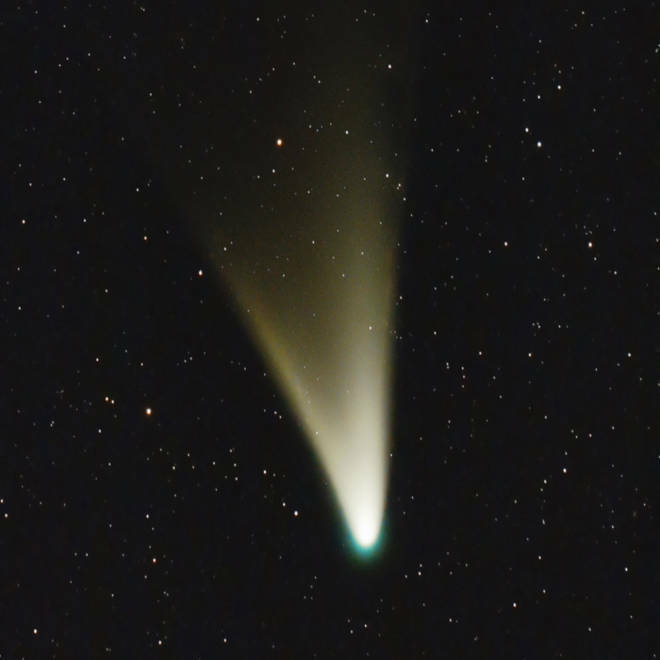 Cast your eyes on pictures featuring PanSTARRS, Hale-Bopp and other crowd-pleasing comets. Copyright 2013 Space.com. All rights reserved.